Whether insuring a high-value home and family auto or designing a custom commercial insurance package, Morris & Templeton provides the personal attention and informed guidance every client deserves. They will help you compare quotes and choose the policy that best fits your needs and budget. Since 1981, this independent agency has proudly offered personal advice on car, business, life and high-value home insurance to clients in Georgia communities surrounding Atlanta, Savannah and Hilton Head. Their knowledge of the insurance industry, combined with our relationships with multiple providers, allows them to provide customized solutions and competitive quotes for a wide range of personal and commercial insurance coverage. The Savannah Council on World Affairs is also grateful to Morris & Templeton Insurance for its support. Consider Supporting Us with a Membership. We rely on our modest membership fees to cover speaker expenses, our Student Fellowship Program and operational expenses on an all volunteer basis. We have no salaried staff. Please join us, or renew your membership if it has lapsed. To do so click here and follow the simple instructions. You can join or renew online or via check if you prefer. 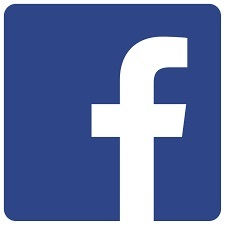 If you aren’t sure if your membership has lapsed simply Contact Us and we’ll let you know. Thank You very much. (Individual membership is $40 annually, Family is $60, Contributing is $100, Sustaining is $250 and Sponsor Level membership is $500). 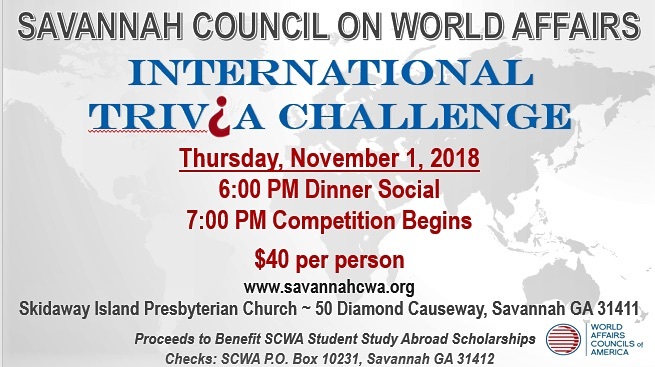 November 1, SCWA International Trivia Night. Click HERE for details. Thursday, November 15: Liz Brailsford, Chief Operating Officer of the World Affairs Councils of America, will be our guest speaker. Meeting dates for 2019 have been selected (Jan. 17, Feb. 21, March 21, April 18 and May 9) and we will announce our line-up of speakers later this fall. DON’T FORGET TO MARK YOUR CALENDARS FOR OUR INTERNATIONAL TRIVIA NIGHT ON NOVEMBER 1. DINNER AT 6PM; TRIVIA BEGINS AT 7PM. Click HERE for details, or click Events tab above to purchase tickets.